Become the Predator from the classic action movie today. Slip on this mask and you'll instantly be feared by all those in your path, even those who haven't seen the movie! This cast-resin movie replica mask features velcro straps for a custom, comfortable fit. There's also a chain which allows the mask to be hung if you'd rather display it. Get this mask and some great alien weapons to go with it for the perfect fantasy cosplay costume. I am a huge predator fan, with a predator themed movie room. I bought this on a whim because I cant have too many predator items! Thought it would be cheap since the ridiculously great price. Just for insight, I dropped it from 4 inches on my foot by accident and it left a bruise haha. Amazing detail, great weight, just reinforce the chain before you try to hang it. Also, mine unexpectedly came with a port for batteries to be put in (by the laser), still cant get it to work ( may be dead batteries). Regardless, after years of using Bud K, I am ALWAYS impressed with what I get. 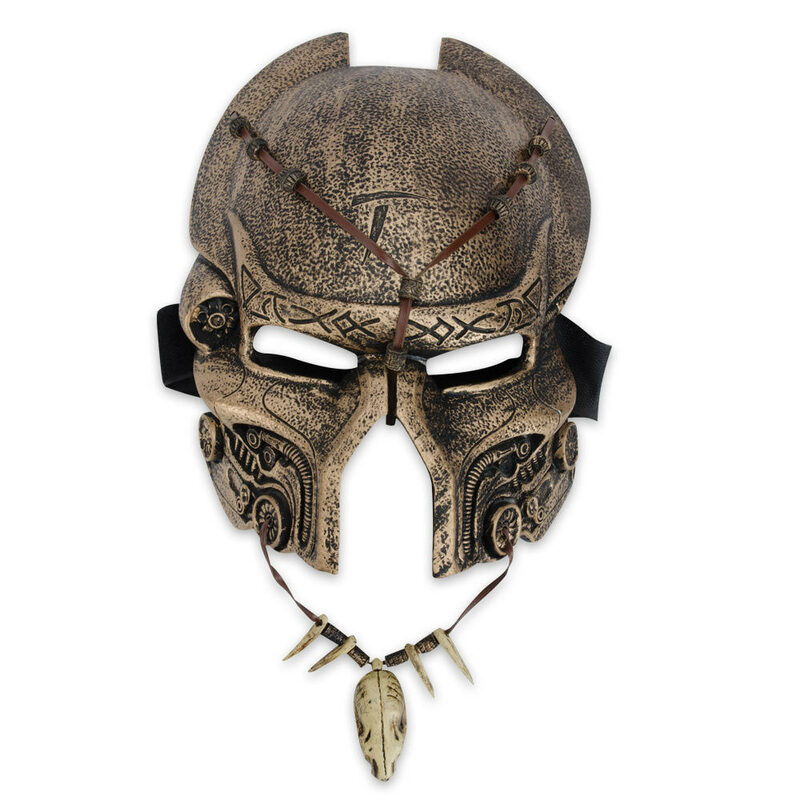 If you love predator, you will LOVE this mask. Hello, I just received this in the mail today. I thought it was going to be a cheesy Halloween store mask....it is not. This is a very good replica of the predator mask. There is nothing cheap about it. Its unbeatable for the price. Just be warned not to hang it with its original chains. It will fall off the wall and I don't know if the hard plastic will be able to handle the fall from a 4 foot drop. Upon opening package, I held the mask up by the chain (for 5 seconds) and chain broke, the mask hit the floor and didn't break. So Do NOT Use that chain. Also the foam packaging had a 3 pack of small button batteries in it with Mask...? Ok. So WTF is that for? Response: Mike, thank you for your review. We would like to first apologize for the chain breaking, we have taken a look at the product and the batteries are for the light on the right cheek of the mask. If you contact our customer service department at [email protected] or 1-800-630-2835 we can get that mask replaced for you. This mask and the previous one that was offered, make great wall hangings. Not too much money to have a very interesting piece of movie "props" that will have everyone talking about them. I hope to see more in the collection soon! This mask is amazing! The detail is great. This is the second predator mask I have bought from BudK and I hope they have more in store! Great Price Moive quiality Detail Looking foward for the next one. Detail is great light weight and a great peice to add to any personal collection and great to show a must buy. I was highly impressed with both the quality and price of the original predator mask that I purchased a few months ago and was a little skeptical about purchasing the tribal predator mask considering how cheap it was at $19.99. Boy, was I wrong! The necklace that comes with seems worth that alone! It is a masterpiece! It's heavy, well-crafted, and a beautiful companion piece to the original! You rock BudK!